The ultimate solid state quarter only coin acceptor with bent coin release, coin sense optics, and 4-wire relay output. Diameter accuracy of .015″ at a rate of 20 coins per second* (see notes). Options Include: -A MA602 insert only; -F MA602 insert mounted in MA19 2″ wide stainless steel faceplate; & -C MA602 insert mounted in MA20 2″ wide “Old Style” faceplate. 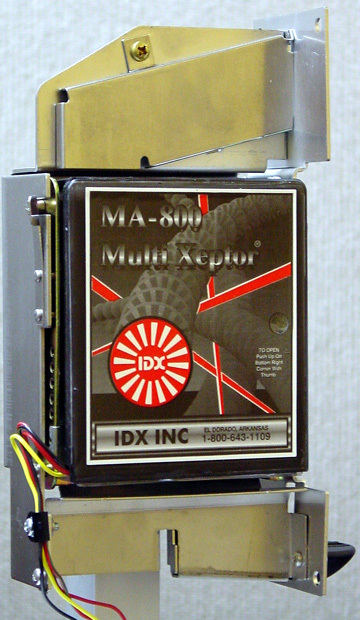 IDX’s MA850 SERIES of Hawk Xeptors will accept a mixture of 6 different coins and/or tokens types making it an international Xeptor. Standard features include higher security anti-stringing credit sense optics added, electronic size detection within 0.015” and patented electronic metal sensors to better distinguish between similar metals. The complete line of IDX multi-coin Xeptors® are field programmable for new coin types as well as changing the number of coin pulses per coin. Other high security features include IDX’s own processor circuit, a shielded relay with the universal relay wiring, power wires Yellow & Black and relay wires 2 Red w/Green tracer output signals for greater reliability and easy field connections. This “smart” Xeptor continues to update its memory on each coin as the Xeptor ages. The newest standard feature in this series is the 2 YEAR WARRANTY that includes advanced replacement in the first year. IDX’s MA85CC SERIES of Hawk Xeptors will accept a mixture of 12 different coins and/or tokens types making it an international Xeptor. Standard features include higher security anti-stringing credit sense optics added, electronic size detection within 0.015” and patented electronic metal sensors to better distinguish between similar metals. The complete line of IDX multi-coin Xeptors® are field programmable for new coin types as well as changing the number of coin pulses per coin. Other high security features include IDX’s own processor circuit, a shielded relay with the universal relay wiring, power wires Yellow & Black and relay wires 2 Red w/Green tracer output signals for greater reliability and easy field connections. This “smart” Xeptor continues to update its memory on each coin as the Xeptor ages. IDX’s X12 series of multi-coin Xeptors® will accept a mixture of 6 different coins. This coin mixture can consist of any combination of currencies, tokens and X- Mark® or Smart Mark® encoded security tokens. The X12 Xeptor has internal programming to allow the operator the ability to program new coins, change the number of coin pulses per coin and field self-diagnostic information. Coin pulses are released through a shielded relay to offer the OEM an easier interface for multiple coin voltage requirements. Other coin outputs are available to meet the different demands of the OEMs. All models come standard with coin sense / anti-stringing optics for added security. This smart thinking Xeptor continues to update its memory on each coin as the Xeptor ages. Digging coin jams out is a thing of the past. The built in coin release opens the chute to drop through bent and mutilated coins. Coin jams are also caused where bent faceplates are misaligned with the Xeptors faceplate to meter doors. This has been eliminated with the introduction of a new all stainless steel snap-in faceplate Model MA19 which relieves the strain from bent doors. The ultimate solid state Multi-Metal / Multi-Coin Xeptor. The OEM’s “Dream Xeptor” with it’s field programmable, multi-national coin capability. The MA800 accepts 6 different sizes of coins or tokens with different values. Its exclusive electronic design offers a bent coin release in an electronic Xeptor to make coin jams a thing of the past. The Hawk offers a multi-color indicator LED for operational status & field diagnostics. Diameter accuracy of .015″ at a rate of 20 coins per second* (see notes). The ultimate solid state Multi-Metal / Multi-Coin Xeptor. The OEM’s “Dream Xeptor” with it’s field programmable, multi-national coin capability. The MA812 accepts 12 different sizes of coins or tokens with different values. Its exclusive electronic design offers a bent coin release in an electronic Xeptor to make coin jams a thing of the past. The Hawk offers a multi-color indicator LED for operational status & field diagnostics. Diameter accuracy of .015″ at a rate of 20 coins per second* (see notes). IDX’s X10 series of multi-coin Xeptors will accept a mixture of 6 different coins. This coin mixture can consist of any combination of currencies, tokens, and X-Mark® or Smart Mark® encoded security tokens. The X10 Xeptor has internal programming to allow the operator the ability to program new coins, change the number of coin pulses per coin and field self-diagnostic information. The Eagle offers a multi-color indicator LED for operational status & field diagnostics. Coin pulses are released through a shielded relay to offer the OEM an easier interface for multiple coin voltage requirements. Other coin outputs are available to meet the different demands of the OEMs. This smart thinking Xeptor continues updating its memory on each coin as the Xeptor ages. Digging coin jams out is a thing of the past. The built-in coin release opens the chute to drop through bent and mutilated coins. Coin jams are also caused where bent faceplates are misaligned with the Xeptor’s faceplate to meter doors. This has been eliminated with the introduction of a new all stainless steel snap-in faceplate, Model MA19, which relieves the strain from bent doors. Diameter accuracy of .015″ at a rate of 20 coins per second* (see notes). Optional are the “Old Style” MA20 2″ faceplate, credit sense optics for extra security, and programmable multi-denominational diverter controls direction for presorting coins. Compare IDX’s Xeptors, past and present. Optical Code Read: IDX holds patents covering the X-Mark and SmartMark “minted facet” technology and the new H-Mark “holographic facet” technology, each of which add security against cross play and counterfeiting. X-Mark and H-Mark tokens are produced under license by Osborne Coinage, and SmartMark tokens are produced under license by Roger Williams Mint. Diameter Accuracy: The diameter accuracy quoted is based on the statistical standard deviation in the measurement of a large number of coins. (This pretty much means the average error.) The cut-off point for acceptance/rejection is typically approximately 3 times the standard deviation value in the table. Coins Per Second: This is the rate for rejecting a bad coin among a stream of otherwise good coins. The rate for acceptance of a stream of 100% good coins is approximately 33% higher. The quoted rate is based on coins in the mid range of diameters the unit accepts. The rate is generally a bit higher for smaller coins and a bit lower for larger coins. IDX coin acceptors have the industry standard 3.5″ wide and 4.0″ tall dimensions with three shoulder screw locations on each side. See dimensional drawings for details. Each IDX coin acceptors has an 8 pin header which connects to one of many Personality Plugs which adapt it to all popular connector types used in the industry. IDX coin acceptors have a unique coin centering coin chute and small metal alloy sensors which enable them to separately measure the alloy on both the edge and center of bi-metal coins. All IDX coin acceptors, excluding the MA602, can be optionally ordered with or without built in credit optics used to verify that the coin has passed the gate relay in the proper direction and speed. All IDX coin acceptors, excluding the MA602, may be programmed by hand using a procedure for dropping sample coins through the unit. Xeptors with version 4.0 and later firmware can be programmed at the touch of a button using a hand held Coin Selector device. The hinged opening door-like construction of all IDX coin acceptors allows for easy release of bent or shingled coins without the worry that someone will do damage with a screwdriver. Long term stability of acceptance is assured via firmware that automatically compensates for component age, temperature effects, and other physical configuration changes.